Amber didn’t have school three days this week because of the cold and on Tuesday night we decided to watch a movie. We all like the X-Men movies and none of us had seen The Wolverine yet, even though David was sure he had. They all do get a little confusing, I admit, between the X-Men movies and the two Wolverine ones. At the beginning of the movie, Wolverine, Logan, has put his past behind him and seems to be camping out in the wilderness somewhere, avoiding society. Until a cute, young Japanese girl comes to get him, telling him that a man he had saved at Nagasaki during WW 2, wants to say goodbye. Against his better judgement, he heads off to Japan and right into a mess. Jean is haunting his dreams. He’s got a Japanese billionaire trying to take his healing power, and therefore his immortality, which he kind of sees as a curse anyway. He ends up protecting that same billionaire’s daughter who people are trying to kill. And of course, he has to fight ninjas. There’s plenty of fight scenes and several moments of Logan questioning who he is and who he wants to be. I don’t want to spoil the end, but he is Wolverine, we know he’s going to pull himself together, and be stronger and more determined. He’s a tough guy, he doesn’t care if we like him or approve of his actions, he does what he needs to do. And sometimes he makes me laugh. My one complaint was with the mutant bad girl, Viper. She was a bit plastic, if that makes sense. I would have liked her to pull her own weight, but she was probably the least interesting of the characters. And there was one fight scene on top of a train that I though was rather ridiculous, but that’s just me. And it’s supposed to have ridiculous fight scenes, it’s part of the comic book turned movie thing. It was an entertaining movie. I just wish we had had some popcorn while we watched it. I still haven’t seen this. I really like the idea of X-men, but haven’t really got into the movies. I think my guys liked it too. I’d probably watch it for Hugh Jackman. I watched this a few weeks ago and didn’t love it. I do like Hugh Jackman though. I got this one for Christmas and finally got to watch it too! Loved it!! X-Men are my favorites of the superheroes, and I can never get enough Wolverine!! 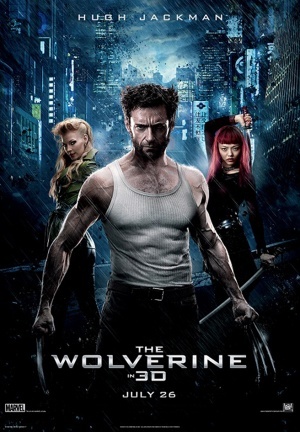 I saw Wolverine 2009 but not this one yet. Not sure why since I love Jackman as Wolverine!